Consolidative radiotherapy after immuno-chemotherapy in localized bulky diffuse large B-cell lymphoma (DLBCL) patients significantly improves both, overall and progression-free survival and treatment is in principle curative. Therefore protection of organs at risk is highly relevant. 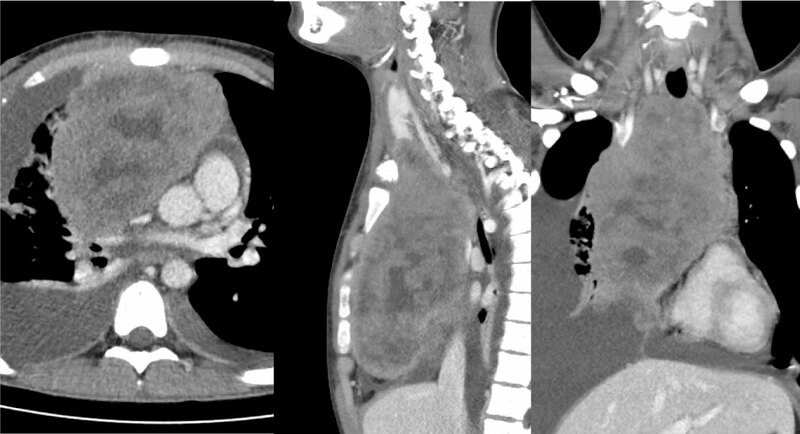 Two 53-years and 18-years old patients with bulky mediastinal DLBCL were planned with and without deep inspiration breath-hold (DIBH) and volumetric modulated arc therapy (VMAT). DIBH reduced the doses to the heart and the lungs while homogeneity and conformity were not compromised. The number of Monitor Units (MU) needed was significantly reduced by DIBH-VMAT. Both patients were treated in DIBH-VMAT. Planning with DIBH in bulky mediastinal DLBCL is feasible and should be taken into account due to the high relevance with regard to acute and late toxicity. Diffuse large B-cell lymphoma (DLBCL) constitutes 30 to 40% of all aggressive non-Hodgkin's lymphoma (NHL). The current primary standard systemic therapy consists of the anti-CD20 antibody rituximab plus cyclophosphamide, doxorubicin, vincristine and prednisone (R-CHOP). Consolidation radiation therapy (RT) has shown to improve significantly both overall survival (OS) and progression-free survival (PFS) even in the rituximab era significantly and also in patients with non-bulky-disease [1-3]. The advances with chemotherapy and radiotherapy have considerably increased the survival rates. Most of the patients are in a middle age of 50 to 60 years and the treatment is in principle curative with a five year PFS of 75-90%. Therefore on the one hand, DLBCL has to be adequately treated to reach a curative outcome, on the other hand RT-delivery should avoid critical dose burden to organs at risk, i.e. especially the heart and the lungs, in order to reduce late cardiac morbidity and the risk for secondary lung cancer. In Hodgkin's disease, the relative risk (RR) of secondary lung cancer increases considerably in relation to the dose of ionizing radiation, with a RR of 9.6 when more than 9 Gy are administered . Less is known about the correlation between NHL and second lung cancer. Although, the RR is higher in long-term NHL survivors than in healthy individuals. The risk for cardiac mortality and secondary cancers can be estimated using calculation models. Toltz, et al. used the relative seriality model to predict excess risk of cardiac mortality and a modified linear quadratic model to predict the Excess Absolute Risk (EAR) for induction of lung cancer and breast cancer in patients with Hodgkin's Lymphoma, NHL or breast cancer . They compared the results of 3D conformal photon radiotherapy (3D-CRT) and intensity modulated proton therapy (IMPT). The excess risk of cardiac mortality was 0.9% versus 0.5% and the EAR for lung cancer were 17.5 cases per 10,000 persons per year (PY) and 10.1. Mean EARs for breast cancer were 8.2 and 2.8 PY. Therefore, with regard to these long-term and potentially life-threatening side effects, it may be necessary to save dose on normal tissue also with photon techniques. Deep-inspiration breath-hold techniques (DIBH) can substantially reduce radiation dose to the heart in breast cancer resulting in a reduction of life years lost (LYL) . The recent advances in RT delivery as intensity-modulated radiotherapy (IMRT) and DIBH can also be beneficial for less common treatments than breast cancer and may be worth being considered in commonplace planning for such patients. There is evidence in literature that DIBH-IMRT could be beneficial in patients with Hodgkin lymphoma and mediastinal mass . Two 53-years (A) and 18-years (B) old male patients with a stage IB B-NHL were planned for consolidation RT. 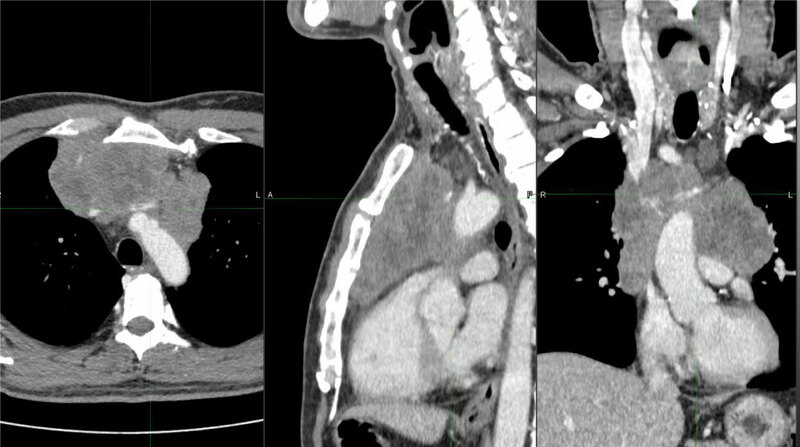 Both patients presented initially with a history of cough, weight loss, night sweats, fatigue, finally superior vena cava obstruction and pleural effusion in patient B, Computed tomography (CT) showed a bulky disease with a mediastinal mass of 12.4 × 7.2 cm (A) and 20 × 12 cm (B) consistent with lymphoma (Figure 1A and Figure 1B). Positron emission tomography (PET) for staging and evaluation of treatment response as international standard was not done in patient A because PET of aggressive lymphomas is not included in the catalogue of benefits of the statutory health insurances in Germany. PET for restaging was requested and approved by the health insurance as a special case in patient B. The biopsy confirmed a partially necrotic and sclerotic primary mediastinal B-NHL in both patients. None had bone marrow involvement and cerebrospinal fluid was negative. 6 cycles of R-CHOP-14 (every 14 days) and 2 cycles of rituximab were administered and restaging with CT after systemic therapy showed a partial response (PR) according to Lugano Response Criteria for NHL . PET for restaging was completely negative in patient B. The planning target volume (PTV) encompassed the original suspicious volume prior to chemotherapy and spared the lungs as involved-site radiation therapy (ISRT) (Figure 2A). The target was delineated by a single radiation oncologist on 4D-CT (FB) and on DIBH-CT. The gross tumor volume (GTV) was the residual tumor volume after R-CHOP. The planning was done two weeks after the last rituximab infusion and RT started one week after CT. The lungs and the heart were auto-segmented, the contours were reviewed and adjusted due to the published guidelines [9,10]. Due to PR in CT a complementary total dose of 45 Gy (A) and 39.6 Gy (B) in single doses of 1.8 Gy were prescribed to the PTV. Before simulation with CT an initial training with the patients and with the Active Breathing Coordinator System (ABC - system, Elekta) was necessary. The training aims to determine the breathable volume of the patient during deep inspiration and the possible time interval of DIBH phase. The post-training values were 2.4 liters (A) and 2.0 liters (B) and 25 (A/B) seconds in DIBH. Time interval was 20 seconds. DIBH clearly expanded the lungs volume and shifted the heart into the caudal direction (Figure 2B). Thus, large parts of the lungs and heart moved away from the prescription isodose region. The CT simulation was performed on a 16-slice Philips Big Bore CT scanner (Philips). The scanner is equipped with a LAP Dorado 4 laser system. Together with the application software Tumor LOC (Philips), the isocenter was fixed and marked on the skin without additional fiducials and afterwards sent to the planning system via DICOM export. The patient was immobilized in an upper body BlueBAG vacuum cushion (Elekta, Medical Intelligence). The vacuum cushion was attached to the imaging table (iBeam evo Couchtop, Elekta) with indexing bars. The imaging table is identical to the treatment table, which means that it ensures a reproducible positioning during the whole irradiation series. The patient was placed in the vacuum cushion in a supine position with his hands over his head. Both arms cross in the area of the wrists. Two CT scans were performed in helical mode. The first scan took place in the free breathing mode and the second scan in DIBH with the values from the initial training. The scan reached from the chin to the thoracic vertebra 12. Because there is no interface to the ABC system on the CT scanner, for the breath hold phase, the patient was coached via microphone from the control room. After the CT scans, both data sets, including isocenters, were sent to the planning system via DICOM export. The treatment plans were prepared using the treatment planning system Pinnacle, Version 14.0 (Philips, direct machine parameter optimization planning algorithm). IMRT planning was done as provided by ICRU 83. PTV Dmean is the prescribed dose (A: 45 Gy; B. 39.6 Gy). D2 ("near max") should be maximum 105% of prescribed dose. D95 ("near min") should be 95% of the prescribed dose. For organs at risk the planning is done with the following constraints: Spinal cord maximum dose < 45 Gy (A: 36 Gy, B: 20 Gy), heart Dmean < 15 Gy (Table 1A), lungs Dmean < 20 Gy or 37% < 20 Gy (Table 1A). PTV was relatively larger in patient A than in patient B due to 4D-movements and DIBH had a larger impact on volume sparing in A. Quality parameters as homogeneity index, conformity index are given in Table 1B. One plan was created in free breathing (FB) mode and one in DIBH mode. For both plans volumetric modulated arc therapy (VMAT) was planned as irradiation technique, with two rotations each. The default rotation angles were counter clockwise from -178° to +182° and clockwise from +182° to -178°. In both cases, the aim was to achieve a maximum of homogeneous and conformal dose as possible in the target volume while keeping the dose of the adjacent organs at risk as low as possible [11-13]. The main focus was on the dose levels of the two lungs and the heart which should be as low as possible. Several ring structures with appropriate dose limits were created around the target volume as help structures. Thus, both a steep dose gradient outside the target volume and a low dose bath in normal, healthy tissue could be achieved. The treatment machine was an Elekta Synergy linear accelerator (MLCi2) equipped with a multi leaf collimator of 10 mm leaf width and a dynamic dose rate from 50 MU/min to 450 MU/min (VMAT). The planning results are shown in Table 1, Figure 3(A-F). Table 1B also gives the Monitor units (MUs) for FB versus DIBH. For patient A, DIBH caused a reduction of MUs to nearly one third of FB-MUs. For patient B this was 5 percent. Extrapolated over the whole RT-series this would correlate to one fraction of RT. Today, immuno-chemotherapy with rituximab plays a major role in the management of primary mediastinal B-NHL. Four studies before the rituximab era could not clearly define the superiority of the addition of RT to chemotherapy in stage I and II patients [14-17]. One study showed a clear benefit for RT in case of residual disease . Patients with bulky disease clearly benefit from RT and thus an excellent long-term prognosis with 5-year overall survival rates from 75 to 90% can be reached for stage I-II patients [1,19]. Therefore careful attention should be paid to dose reduction to the lungs and heart in order to reduce the risk for acute and late effects inclusive the induction of secondary tumors. Data on the induction of radiation pneumonitis (RP) due to irradiation of Hodgkin and Non-Hodgkin Lymphoma are rare [20,21]. The largest retrospective evaluation in IMRT-planned patients revealed 14% with RP (grade 36.7%) at a median 2.04 months after completion of RT. The risk in patients with refractory or relapsed disease is more than doubled in patients with consolidative irradiation, suggesting that the intensity of previous chemotherapy is also of high significance [21,22]. Additionally, in relapsed tumors often higher radiation doses are prescribed than in consolidative irradiation. The volume of the lung receiving lower doses becomes more clinically meaningful in IMRT-planning: Several studies found that small doses to large volumes (V5 > 55%) might have the greatest impact [21,23,24]. The FB-plan versus DIBH-plan for our patients resulted in a MLD of 14/7.7 Gy (FB, A/B) versus 8/6.8 Gy (DIBH, A/B) and 13.8/10.2 Gy (FB, A/B) versus 8.4/9.2 Gy (DIBH, A/B) and a corresponding V5 of 78.2/47.3% (FB, A/B) versus 43.9/43.7% (DIBH, A/B) and 76.7/73.5% (FB, A/B) versus 51.2/65.4% (DIBH, A/B) on the left and right side, respectively. With respect to the Pinnix-data, where the RP-patients had a mean lung dose (MLD) of 12.9 Gy and a V5 of 58% and the non-RP-patients with a MLD of 10.3 and a V5 of 49%, the planning and irradiation in DIBH might not only be relevant with regards to a reduction of late effects but also to a lowered risk for RP. Lymphoma survivors have an increased risk of fatal cardiovascular events compared to general populations . The pooled number of deaths due to cardiovascular disease-with respect to different confounders as gender, age at treatment and comorbidities-was estimated to be 7.31 and 5.35 times that of normal population for Hodgkin and non-Hodgkin lymphoma survivors, respectively . For mediastinal Hodgkin's lymphoma Paumier, et al. were the first to describe a significant dose reduction of 15% to 20% to the coronary arteries, heart and the lungs by DIBH compared with FB. They partially implemented IMRT with DIBH in one patient . A later planning study from Petersen, et al. evaluated the doses to the lungs, heart and female breasts prospectively by planning in PET/CT with DIBH in addition to staging FDG-PET/CT in FB and a planning CT in both FB and DIBH . They found that DIBH can significantly decrease the dose to the heart and the lungs. IMRT alone without DIBH has no effect on lowering the mean heart dose, heart V20 Gy and lung V20 Gy in a planning study of 22 patients and mediastinal irradiation in Hodgkin lymphoma . Therefore the combination of IMRT and DIBH might be most beneficial to patients with mediastinal irradiation in lymphoma treatment. In 2015, the same team compared the results with additional planning with proton therapy (PT) in FB and DIBH and estimated the risk of life years lost (LYL) by technique . The lowest risk of LYL was offered by proton therapy in DIBH-PT in FB versus IMRT in DIBH had no advantage. Intensity modulated proton therapy (IMPT) in DIBH may have an additional benefit . A recent and large analysis of the rate of second cancers in Hodgkin survivors treated at a median age of 34 years revealed that the most common second cancer is lung cancer in 17.5% of all patients with a general standardized incidence ratio of 2.9 . In order to mitigate the risk for secondary malignancy in the lungs the dose distribution for our patients was anterior-posterior weighted and the reduced lung dose by DIBH may also contribute to lower this risk. MUs were 30 (A) and 5 (B) percent less in our patients. Thus, DIBH could also contribute to a lower risk of second cancer induction by lowering the whole body dose in VMAT. In the presented cases, DIBH was translated from our department's routine left sided breast cancer treatment and literature data from planning studies in Hodgkin patients to real planning and consolidative treatment in mediastinal NHL. The procedure has proven to be feasible and advantageous with regard to organ at risk sparing to a different extent in two different patients. Several studies also in the rituximab era have shown a survival benefit by involved field irradiation even for DLBCL-patients with stage I/II. DIBH and VMAT techniques are available nationwide in contrast to PT and IMPT and thus should be considered in the curative treatment of such cases. It depends on the individual anatomy and PTV-configuration to what extent the reduction can be performed. An individual plan comparison should be done for all patients as DIBH might not always guarantee for better planning results. Nevertheless, all lymphoma survivors should be followed carefully regarding cardiovascular disease and second cancer. Phan J, Mazloom A, Medeiros LJ, Zreik TG, Wogan C, et al. (2010) Benefit of consolidative radiation therapy in patients with diffuse large B-cell lymphoma treated with R-CHOP chemotherapy. J Clin Oncol 28: 4170-4176. Aviles A, Nambo MJ, Calva A, Neri N, Cleto S, et al. (2018) Adjuvant radiotherapy in patients with diffuse large B-cell lymphoma in advanced stage (III/IV) improves the outcome in the rituximab era. Hematology 17: 1-5. Kubuschok B, Held G, Pfreundschuh M (2015) Management of diffuse large B-cell lymphoma (DLBCL). Cancer Treat Res 165: 271-288. Amadori D, Ronconi S (2005) Secondary lung tumors in hematological patients. Semin Respir Crit Care Med 26: 520-526. Toltz A, Shin N, Laude C, Roberge D, Freeman C, et al. (2012) Poster-Thur Eve-73: Prediction of risks of cardiac mortality and secondary cancers after radiotherapy for Hodgkin's lymphoma, non-Hodgkin's lymphoma, and breast cancer. Med Phys 39: 4639. Simonetto C, Eidemüller M, Gaasch A, Pazos M, Schönecker S, et al. (2018) Does deep inspiration breath-hold prolong life? Individual risk estimates of ischaemic heart disease after breast cancer radiotherapy. Radiother Oncol 131: 202-207. Tomaszewski JM, Crook S, Wan K, Scott L, Foroudi F (2017) A case study evaluating deep inspiration breath-hold and intensity-modulated radiotherapy to minimise long-term toxicity in a young patient with bulky mediastinal Hodgkin lymphoma. J Med Radiat Sci 64: 69-75. Cheson BD, Fisher RI, Barrington SF, Cavalli F, Schwartz LH, et al. (2014) Recommendations for initial evaluation, staging and response assessment of Hodgkin and Non-Hodgkin lymphoma: The Lugano classification. J Clin Oncol 32: 3059-3068. Illidge T, Specht L, Yahalom J, Aleman B, Berthelsen AK, et al. (2014) Modern radiation therapy for nodal non-Hodgkin lymphoma-target definition and dose guidelines from the International Lymphoma Radiation Oncology Group. Int J Radiat Oncol Biol Phys 89: 49-58. Feng M, Moran JM, Koelling T, Chughtai A, Chan JL, et al. (2011) Development and validation of a heart atlas to study cardiac exposure to radiation following treatment for breast cancer. 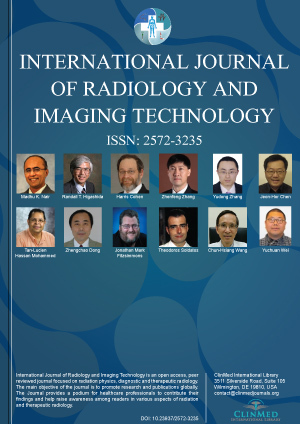 Int J Radiat Oncol Biol Phys 79: 10-18.
International Commission on Radiation Units and Measurements (2010) Prescribing, recording, and reporting photon-beam intensity-modulated radiation therapy (IMRT). J ICRU 10: 34-36. Paddick I (2000) A simple scoring ratio to index the conformity of radiosurgical treatment plans. Technical note. J Neurosurg 93: 219-222. Knoos T, Kristensen I, Nilsson P (1998) Volumetric and dosimetric evaluation of radiation treatment plans; Radiation conformity index. Int J Radiat Oncol Biol Phys 42: 1169-1176. Reyes F, Lepage E, Ganem G, Molina TJ, Brice P, et al. (2005) ACVBP versus CHOP plus radiotherapy for localized aggressive lymphoma. N Engl J Med 352: 1197-1205. Miller TP, Dahlberg S, Cassady JR, Adelstein DJ, Spier CM, et al. (1998) Chemotherapy alone compared with chemotherapy plus radiotherapy for localized intermediate- and high-grade non-Hodgkin's lymphoma. N Engl J Med 339: 21-26. Horning SJ, Weller E, Kim K, Earle JD, O'Connell MJ, et al. (2004) Chemotherapy with or without radiotherapy in limited-stage diffuse aggressive non-Hodgkin's lymphoma: Eastern Cooperative Oncology Group study 1484. J Clin Oncol 22: 3032-3038. Bonnet C, Fillet G, Mounier N, Ganem G, Molina TJ, et al. (2007) CHOP alone compared with CHOP plus radiotherapy for localized aggressive lymphoma in elderly patients: A study by the Groupe d'Etude des Lymphomes de l'Adulte. J Clin Oncol 25: 787-792. Avilés A, Neri N, Delgado S, Pérez F, Nambo MJ, et al. (2005) Residual disease after chemotherapy in aggressive malignant lymphoma: The role of radiotherapy. Med Oncol 22: 383-387. Held G, Murawski N, Ziepert M, Fleckenstein J, Pöschel V, et al. (2014) Role of radiotherapy to bulky disease in elderly patients with aggressive B-cell lymphoma. J Clin Oncol 32: 1112-1118. Koh ES, Sun A, Tran TH, Richard Tsang, Melania Pintilie, et al. (2006) Clinical dose-volume histogram analysis in predicting radiation pneumonitis in Hodgkin's lymphoma. Int J Radiat Oncol Biol Phys 66: 223-228. Pinnix CC, Smith GL, Milgrom S, Osborne EM, Reddy JP, et al. (2015) Predictors of radiation pneumonitis in patients receiving intensity modulated radiation therapy for Hodgkin and non-Hodgkin lymphoma. Int J Radiat Oncol Biol Phys 92: 175-182. Fox AM, Dosoretz AP, Mauch PM, Chen YH, Fisher DC, et al. (2012) Predictive factors for radiation pneumonitis in Hodgkin lymphoma patients receiving combined-modality therapy. Int J Radiat Oncol Biol Phys 83: 277-283. Wang S, Liao Z, Wei X, Liu HH, Tucker SL, et al. (2006) Analysis of clinical and dosimetric factors associated with treatment-related pneumonitis (TRP) in patients with non-small-cell lung cancer (NSCLC) treated with concurrent chemotherapy and three-dimensional conformal radiotherapy (3D-CRT). Int J Radiat Oncol Biol Phys 66: 1399-1407. Schallenkamp JM, Miller RC, Brinkmann DH, Foote T, Garces YI (2007) Incidence of radiation pneumonitis after thoracic irradiation: Dose-volume correlates. Int J Radiat Oncol Biol Phys 67: 410-416. Boyne DJ, Mickle AT, Brenner DR, Friedenreich CM, Cheung WY, et al. (2018) Long-term risk of cardiovascular mortality in lymphoma survivors: A systematic review and meta-analysis. Cancer Med 7: 4801-4813. Paumier A, Ghalibafian M, Gilmore J, Beaudre A, Blanchard P, et al. (2012) Dosimetric benefits of intensity-modulated radiotherapy combined with the deep-inspiration breath-hold technique in patients with mediastinal Hodgkin's lymphoma. Int J Radiat Oncol Biol Phys 82: 1522-1527. Petersen PM, Aznar MC, Berthelsen AK, Loft A, Schut DA, et al. (2015) Prospective phase II trial of image-guided radiotherapy in Hodgkin lymphoma: Benefit of deep inspiration breath-hold. Acta Oncol 54: 60-66. Aznar MC, Maraldo MV, Schut DA, Lundemann M, Brodin NP, et al. (2015) Minimizing late effects for patients with mediastinal Hodgkin lymphoma: deep inspiration breath-hold, IMRT, or both? Int J Radiat Oncol Biol Phys 92: 169-174. Rechner LA, Maraldo MV, Vogelius IR, Zhu XR, Dabaja BS, et al. (2017) Life years lost attributable to late effects after radiotherapy for early stage Hodgkin lymphoma: The impact of proton therapy and/or deep inspiration breath hold. Radiother Oncol 125: 41-47. Baues C, Marnitz S, Engert A, Baus W, Jablonska K, et al. 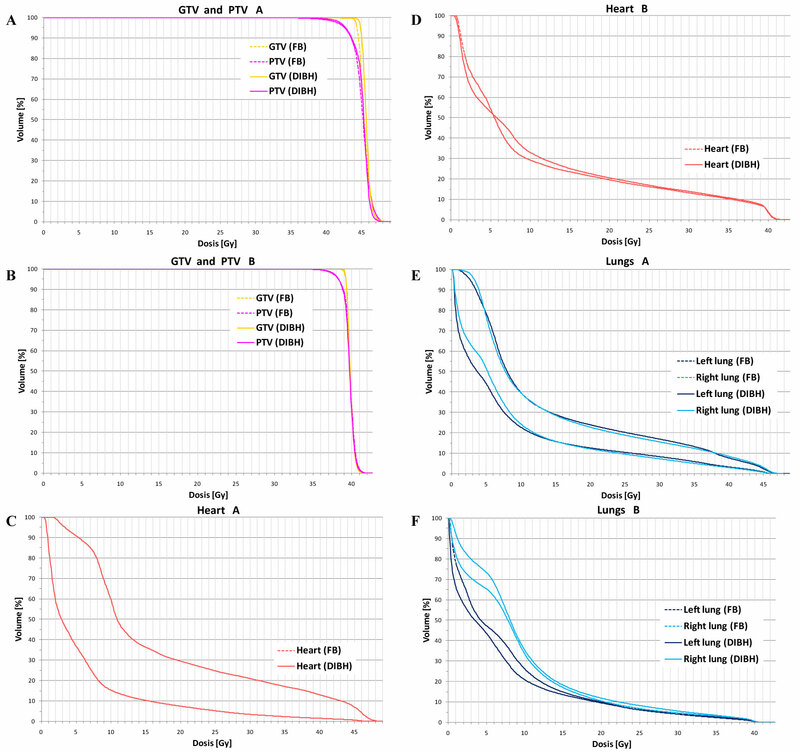 (2018) Proton versus photon deep inspiration breath hold technique in patients with hodgkin lymphoma and mediastinal radiation : A planning comparison of deep inspiration breath hold intensity modulation therapy and intensity modulated proton therapy. Radiat Oncol 13: 122. Petrakova K, Vyskocil J, Grell P, Majek O, Soumarova R, et al. (2018) Second cancers in Hodgkin's lymphoma long-term survivals: A 60-year single institutional experience with real-life cohort of 871 patients. Int J Clin Pract 16: e13235. Antje Fahrig, Radiation Oncology Department, Klinik Und Praxis Für Radioonkologie Und Strahlentherapie, Klinikum Bamberg, Buger Straße 80, D-96049 Bamberg (FRG), Germany, Tel: 49-951-503-12901, Fax: 49-951-502-12909, ORCID ID: 0000-0003-3745-6637. © 2019 Fahrig A, et al. This is an open-access article distributed under the terms of the Creative Commons Attribution License, which permits unrestricted use, distribution, and reproduction in any medium, provided the original author and source are credited.